It isn't as difficult to set up or maintain an African Cichlid tank as you might think. The only real thing to consider is what size tank you’re going to have or can afford and what fish you want to keep in it. These fish need their space. Even the small Mbuna require space, as they are territorial and need a lot of rocks to separate it up between them. It is recommended that a four foot long tank is the minimum size to go for, but this size tank isn't really big enough to keep the larger Mbuna or Haps in. Before doing anything, you need to consider the tank size: the bigger the tank, the more variety and amount of fish you can get. Quite often, a starter will try and grab every type of fish in the local fish store and put them in an unsuitable tank. This will often result in you having to fork out more in the long-run, having to buy a bigger tank to suit your fish. It is recommended that good filtration is the key to the health of your fish. African Cichlid tanks can be over-stocked slightly. To do this, however, you need great filtration and water movement. External filters are the best for the job in this case, as they don’t take up any space in the tank and are often more efficient. Good makes of filter are Rena, Aqua One, Fluval and APS. These are a hardy fish, but good filtration to look after the water is still essential. Most folk also add wave makers. These are usually used on marine set ups and are available through eBay for as little as £10.00. A recommended make for these would be Sun Sun. Another option could be an airstone and airpump, which provides the necessary oxygen for the fish but does not provide the same water movement. Other equipment that you will need includes a heater and lights. Heaters are essential in keeping your tank at a stable 25-28 °C. These are best placed near good flow, so that there is an even cover of heat. Buy a thermometer to monitor the temperature and identify any problems. The Aqua One range of heaters is good, providing different sized heaters for different volumes of water. Lights will often come in a hood when you buy commercial tanks. A common combination is having one white bar and one blue bar, bringing out the best colours for your fish. Many fishkeepers will always purchase LED lights. To learn more about tank equipment, or to ask any questions, go here. Aquascaping is an art and it can take a lot of practice to get your tank looking the way you want it. Malawi Cichlids vary differently. For more information on this, click here.In short, Mbuna are rock-dwellers, and should live in a rocky environment, and Haps and Peacocks should have more open water and sand for free-swimming space. If you want a more natural looking tank go for natural rocks found at the Garden centre, which will be much cheaper than your fish store. Grey rocks like slate & cobble stones will help bring out the colours of your fish, creating a sharp contrast. Another option is ocean rock. This is a good choice and will look more natural once covered in algae. It stacks safer as the rocks interlock with each other. It creates more caves and has holes in it for fry or weaker fish to hide. Plants and bogwood usually aren’t used in Malawi tanks, as there are very few in their natural habitat of Lake Malawi. Any plants that you put in will most likely just be attacked and eaten by the fish. Bogwood will also lower pH, so it isn’t advised to include it in a Malawi Tank. It is a myth that coral sand or ocean rock will raise the pH in your water. What coral sand actually does is buffer the natural pH from your tap water stop your pH from crashing which can kill your fish. If your tap water pH is high enough you can get away with just using sand. You can mix a little coral sand into your normal sand just to be safe, or you can put a bag of coral sand into your filter. Play sand is another good option, although if you get it from somewhere like Argos it can be very fine and really hard to get clean. With play sand you have to stir it up regularly as it compacts down and can trap toxic gasses. Play sand is a clean option, and good for the fish as they dig and sift through the substrate (coral sand can be sharper and may irritate the gills). 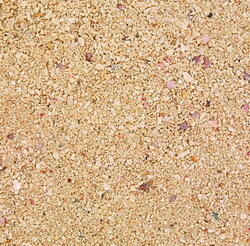 You could also go for kiln dried or sharp sand which are both used by a lot of people. Available from most DIY stores or builders merchants, it is not the preferred substrate as coarse or big gravel is not good for your Cichlids as they like to sift through it. River gravel or any other type of substrate is not recommended for African cichlid set ups. Whatever you decide to use, it should be cleaned thoroughly making sure as much dirt, dust and finer grains are washed out. If it isn't washed out it will make your tank water all milky and it can take days to clear. This can cause damage to your filter. There are a couple of methods on how to wash your substrate. The most common one is to wash it in a bucket under a fast running cold tap, mixing it around with your hands to help get rid of all the bits that you don't want in your tank. You need to do this for a good ten minutes, to ensure that all dirt is removed. You can also put a hose pipe at the bottom of the bucket with some of the sand / gravel on top and turn it on to full power, leaving it to clean itself out in the garden. Better to do a good job the first time, as it’s a lot harder to do once the tank is established. Do I buffer the water or not? Simple answer is no. You are much better off leaving the water alone even if it is a little low for African cichlids, who require slightly alkaline water of around pH 8.The exception is wild caught African Cichlids, as these will be used to the Lake’s natural parameters and extra care needs to be given to these delicate fish. The main thing to note here is that it is better to have a stable pH that you will have more control over, rather than having a slightly higher pH that you mess about with, which could fluctuate more (which is worse for the fish). The boring part. I’m afraid that, once you’ve done all of the above and filled the tank with water, you still can’t add fish. You need to complete a ‘fishless cycle’, where you wait a couple of weeks until the bacterial colonies which convert Ammonia to Nitrites and then to Nitrates have become established. If you have other tanks, add some filter media or substrate from it and you will be transferring the bacteria with it. Another option is to use Tetra Safestart, which will immediately add the necessary bacteria for the aquarium’s biological balance. It is essential that these bacteria are introduced to your aquarium: they will help to establish a natural balance and maintain a good water quality. Once the water parameters have balanced, it’s time to add your fish. If they are all juvies, you will probably be able to add them all at once. If you’re introducing adults, you should stagger their introduction so you don’t overload the biological balance and cause an ammonia spike which can cause diseases.